offering a treat. Shoppers can Discover a wide range of shops from high street stores at the Arndale Centre to the quaint Victorian shopping streets of Little Chelsea, the boutiques in the Enterprise Centre and designer shops at the harbour. The Haddon Hall in Eastbourne has been under the ownership and personal supervision of the Laughton family for over 20 years. 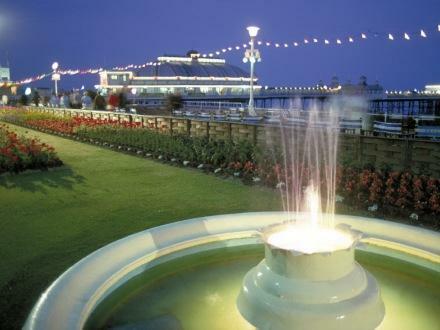 Enviably situated at the seafront end of Devonshire Place, a broad tree lined avenue which links the main promenade with the town centre, so you are centrally situated to make the most of your stay in Eastbourne. 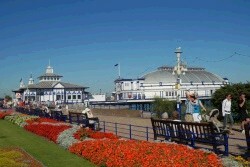 The Bandstand is located across the road from the hotel and the Victorian Pier is a short stroll along the level promenade. En-suite bedrooms offer TV, tea/coffee making facilities and hairdryers. A lift serves all floors & entertainment is provided on three evenings. EXCURSION 1: We head West and take the coast road via Beachy Head and through the picturesque Seven Sisters to Brighton. 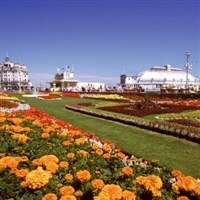 This vibrant town offers so much for its visitors, enjoy the Pier, a walk along the Promenade  head up the British Airway i360 to experience stunning views, visit the Pavillion or enjoy shopping in the Lanes. EXCURSION 2: Heading East today for a visit to Bexhill on Sea, With its Victorian and Edwardian architecture wide-level promenade, gently sloping beach, famous 1930's De La Warr Pavilion and the newly-renovated King George V Colonnade, with gift shops and Tea Beside the Sea café. Venturing inland in the town centre, you'll find independent shops and quality restaurants. EXCURSION 3: We spend the morning in Battle, with its famous Abbey and links to the 1066 Battle of Hastings, this afternoon we continue to Rye, once surrounded by sea, this fortified hilltop town played an important role in the defence of the south coast of England. These days, the river no longer harbours warships and is home to the local fishing fleet, The cobbled streets and secret passages, once the haunt of smugglers and highwaymen, regularly attract film crews in search of historical settings for period productions.